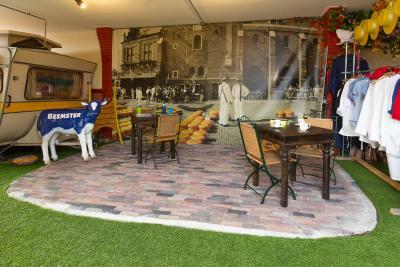 Lock in a great price for Indoor City Camping Alkmaar – rated 8.1 by recent guests! 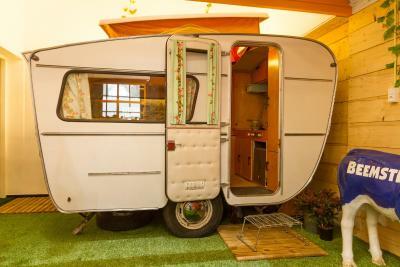 We booked in the camping indoors in a roulotte. Quite different and nice experience from ordinary accommodation in a hotel. The place was clean, the staff very friendly. In short everything. 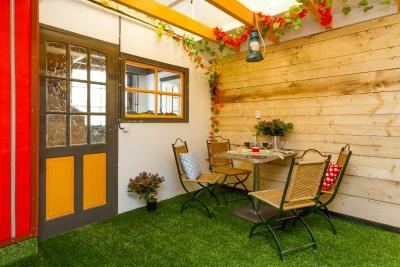 The owner is very friendly, the atmosphere and uniqueness are just great. Would I stay there again ?? 100% yes I would......I loved it. 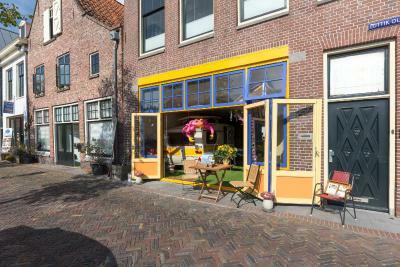 Logement très original, tout confort, très bien situé dans Alkmaar centre ; propriétaire sympathique et à l'écoute. Décoration typique et tenues traditionnelles à disposition pour photos; bref, un séjour parfait. Diese Unterkunft hat uns einfach nur positiv überrascht. Der Wohnwagen ist lediglich der Schlafraum mit wirklich guten Matratzen und befindet sich innerhalb eines Gebäudes. 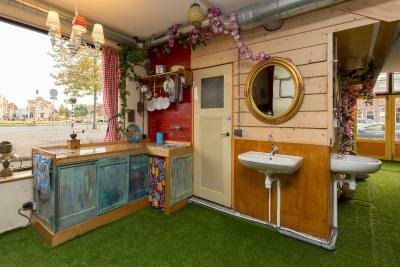 Um den Wohnwagen herum findet man einen Wohnraum mit Essbereich, eine kleine Küche, eine Gästetoilette, ein Stockbett mit zwei weiteren Schlafplätzen und einen Waschbereich mit Toilette und Dusche. Wer Outdoorcamping kennt, hat sicher Spaß am dieser Unterkunft. Wir haben mit Frühstück gebucht. Dies wurde liebevoll zusammengestellt vor unserem Zimmer abgesetzt und wie haben uns über warme Brötchen, Baguettes, Croissants frischen O-Saft und vieles mehr freuen können. Kostenfreie Parkmöglichkeiten befinden sich am gegenüberliegenden Ufer, dass man ganz unkompliziert mit einer kleinen Fähre, die sich in unmittelbarer Nähe befindet erreichen kann, die kostenfrei benutzt werden kann und ständig von einem zum anderen Ufer fährt. Het ontbijt was lekker. We misten alleen het zout bij ons eitje😉de caravan fantastisch. 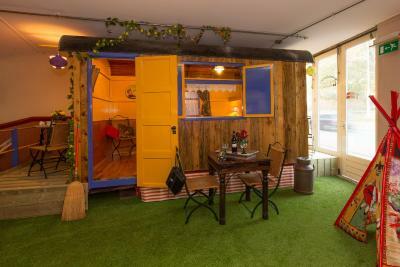 Het hele concept van indoor camping vonden we erg leuk. Die Idee ist total genial! 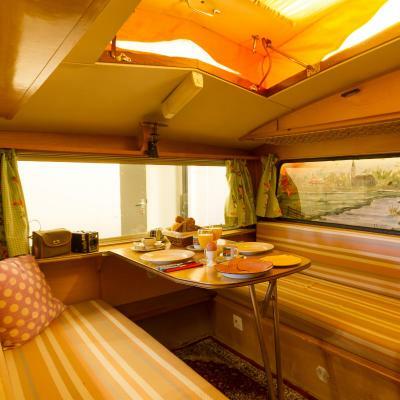 Die Wohnwagen sind im Original. Das vermittelt definitiv Nostalgie. Top! Het was heel gezellig aangekleed en alles was super schoon! 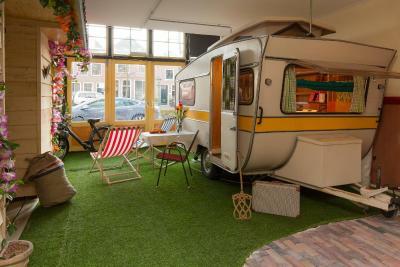 Indoor City Camping Alkmaar is located right next to the Victoriepark in the center of Alkmaar and offers a 60's themed mini caravans with free WiFi access. 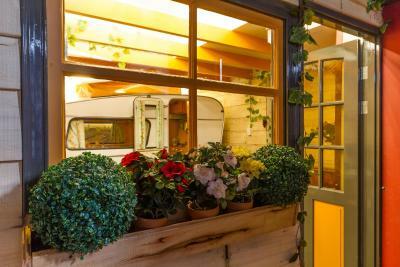 Each unit at the unique indoor camping site comes with a bathroom. 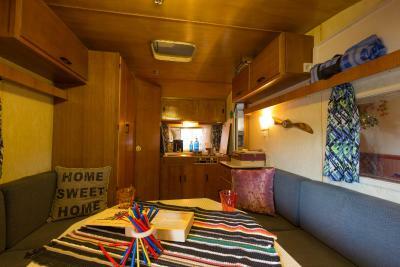 The caravan can also be connected and rented as one larger unit. Breakfast is available upon request at an additional charger. 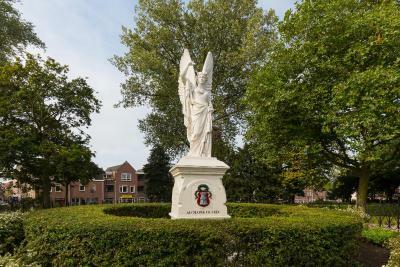 The inn is 1,300 feet from Dutch Cheesemuseum, 1,300 feet from National Biermuseum and 0.8 mi from Alkmaar Station. Schiphol Airport is 22 mi away. 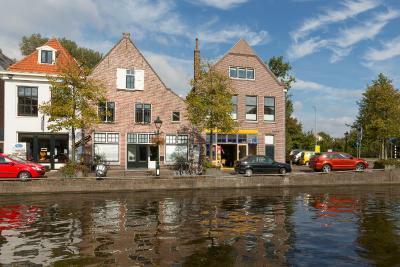 뀐 Located in the top-rated area in Alkmaar, this property has an excellent location score of 9.0! 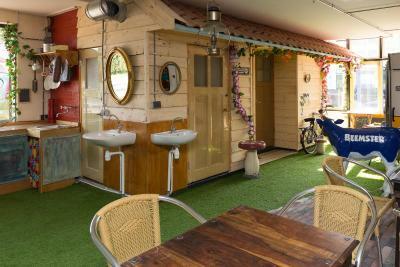 When would you like to stay at Indoor City Camping Alkmaar? This mini caravan comes with its own private bathroom and kitchen. 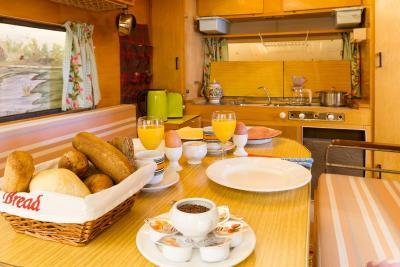 This double room features a kitchenware, seating area and stovetop. 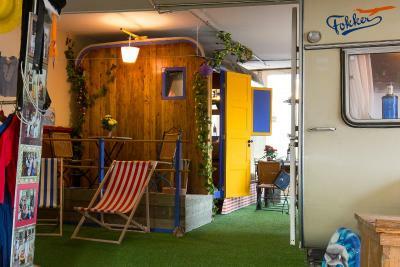 House Rules Indoor City Camping Alkmaar takes special requests – add in the next step! - One child under 4 years is charged EUR 10 per person per night in a child's cot/crib. - The maximum number of children's cots/cribs in a room is 1. Please note that pets are only allowed upon request and only after confirmation from the property. Please note that guests who are staying longer than 7 nights are required to pay the full amount of the reservation on the day of booking. 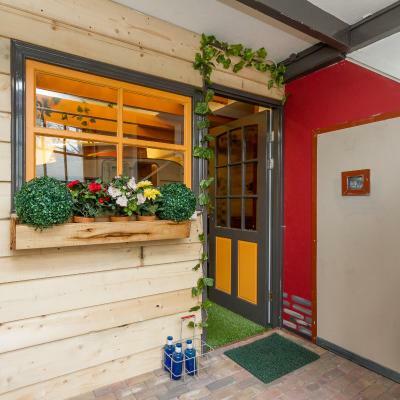 Payment details will be sent by the property. 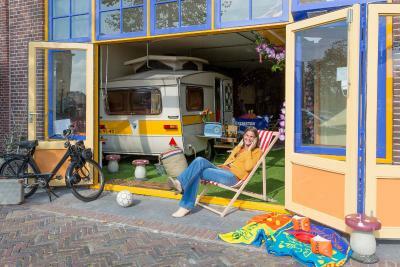 Please inform Indoor City Camping Alkmaar of your expected arrival time in advance. You can use the Special Requests box when booking, or contact the property directly using the contact details in your confirmation. 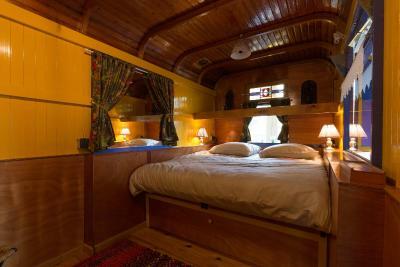 Caravans, showers could do with modernising. The bed length bed not appropriate if you are tall. Fee/ night a bit pricey considering shared bathroom and no breakfast included.